Home Off Beat	Manage your coins with swift automatic coinsorter! Why spend hours sorting out the contents of your piggy bank, when this new model of electronic coinsorter can make your task easier and efficient! Yes, just put all the coins that you have saved into its sorter funnel and watch the ‘Coin Sorter’ organizing all your coins. The coins sorted get collected in the transparent little vessels of £2, £1, 50p, 20p, 10p, 5p, 2p and 1p. Once the Coin Sorter has accomplished the task assigned, it becomes easy to calculate the amount one has saved. 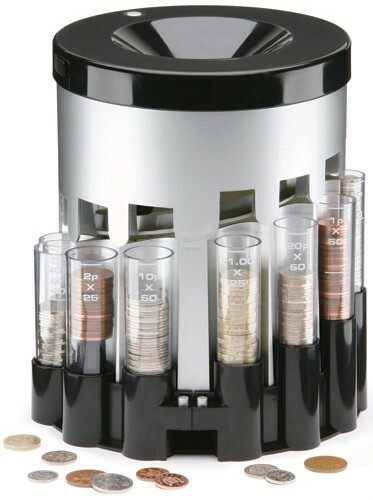 Well, the coin sorter, available in 14 euros, can also be an ideal gift for those who have passion for coin collection. It would get them rid of manually sorting out mountain of coins.